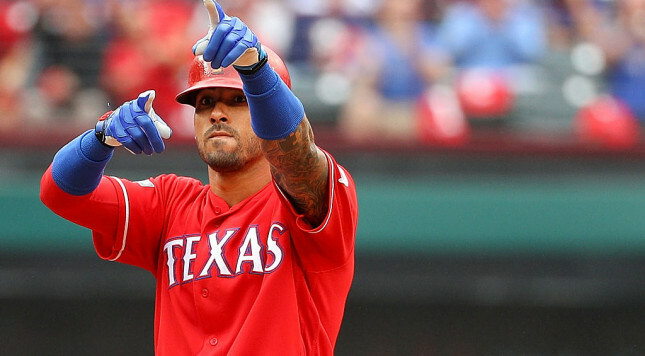 The newest member of the Colorado Rockies is shortstop/outfielder Ian Desmond, who inked a five-year, $70 million deal with the team on Wednesday morning. This is fine. The money isn’t outrageous. Five years isn’t too long. Giving up the 11th overall pick in the MLB Draft to sign Desmond is a bit short-sighted, but whatever. It’s this note that raises an eyebrow. Ian Desmond, first baseman. What the hell? In fairness to Colorado, I don’t think they have any intention of actually playing Desmond at first base. It would be patently absurd, given how the 31-year old thrived as as outfielder with the Rangers in 2016. But the Rockies have a glut of players in their outfield, including Carlos Gonzalez (signed for a little over $20 million in 2017), Gerardo Parra (just signed last year and still owed roughly $20 million), Charlie Blackmon (two years of arbitration eligibility left), and 22-year old prospects David Dahl and Raimel Tapia. There’s no room for Desmond there. Unless, of course, the Rockies trade one (or two) of those outfielders to acquire pitching to bolster their rotation. Dahl should be playing every day after hitting .315/.359/.500 in 63 MLB games last year. Parra has no value to another team after he turned in a pathetic 2016, slashing just .253/.271/.399 in 102 games. 2016 was Tapia’s lone year with experience above high-A, so he could probably use some more seasoning in the minors. That turns the attention to Blackmon and Gonzalez, who both have value. Blackmon is coming off a career year in 2016, hitting .324/.381/.552 with 29 homers and 17 stolen bases. The 30-year old hit equally well on the road and at Coors Field (which is somewhat shocking, given the park effects in Denver), and didn’t struggle against lefties, slashing .331/.392/.451 on the season. Gonzalez is more of a known commodity, and one that has seemingly been on the trade market for years. After an injury-plagued 2014, Gonzalez logged over 600 plate appearances in both 2015 and 2016, hitting .298/.350/.505 with 25 long balls last season. Unlike Blackmon, Gonzalez is a much worse hitter on the road (.966 at home in 2016, just .744 away), and is also significantly worse against lefties than righties (.786 OPS vs southpaws, .883 against right-handers). What *should* the Rockies do? On paper, it’s easy – play Desmond in the outfield every day alongside Dahl and one of Blackmon or Gonzalez, with the other (Blackmon would likely fetch more) being dealt for pitching help. Colorado’s publicly revealed plan – play Desmond at first base and let the outfield logjam fester – doesn’t make the best use of their assets. And yes, the Rockies still do need a first baseman. Their primary starter at the position last year was Mark Reynolds (yes, *that* Mark Reynolds, still somehow in the league), who hit just 14 homers in 118 games. The Rockies have been linked to Jose Abreu, Edwin Encarnacion, and Mark Trumbo over the last week or so, but committing $70 million and the 11th overall pick to Desmond seemingly takes them out of the running for one of those players. So, what the hell will happen? I have no idea. The Colorado Rockies are a franchise that often does things that make sense in a vacuum, but not for this team. The contract given to Desmond would have made sense for a number of teams. But for the Rockies? It just makes me scratch my head, and wonder what’s next for them.